Response card: Pearl White Italian pearlized cardstock. A Rich and Sophisticated Portfolio Invitation Navy Blue, White and Silver, made from luxurious Italian pearlescent papers. Portfolio Invitation with mounted invitation and rsvp set. You can use this invitation for a two language wedding by mounting two invitation cards opposite each other, and stacking the rsvp set at the back of the invitation. Extra 25 cents. Please call us to order, if you want this option. PAPER FACTS: Paper and envelopes are made from FSC certified paper, made without metal or foils, is recyclable, biodegradable, elemental chlorine free. Paper is made in Italy. A modern and sophisticated portfolio invitation that opens to a wide landscape of 16" x 5". Invitation card and rsvp set are mounted inside, using white photo-corners. 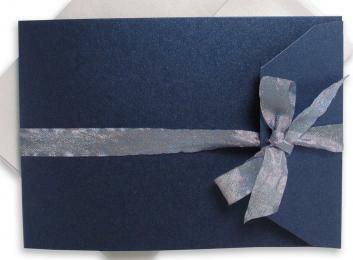 Colors: Navy blue, crisp white, silver-blue ribbon and silver photocorners. Portfolio:Die-cut and scored portfolio wrapper made from deep navy blue pearlescent cardstock from Italy. Measures 16"x 5" open and folds to 5"x7". Mailing Envelope:Matching white A7 pearlescent envelope. Ribbon:One yard of silver-blue textured ribbon per invitation. MS Word printing templates if you plan to print this yourself.